San Diego Zoo Global has a long history of breeding success with okapi, with 70 okapi born at the San Diego Zoo and Safari Park since 1962. 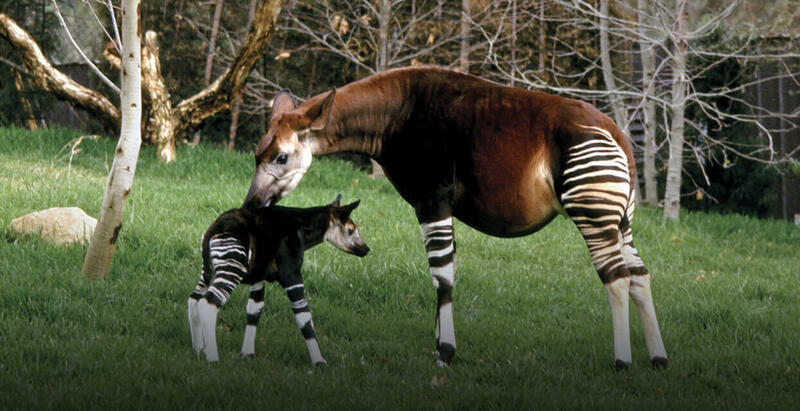 Joining our partners in the Association of Zoos and Aquarium’s Okapi Species Survival Plan (SSP), we exchange animals with other breeding institutions to maintain genetic diversity in the North American population. Our Reproductive Sciences team monitors the estrous cycles of all female okapi at the Zoo and Safari Park to help inform management about the timing of natural breeding, and to document reproductive cycle length and frequency in our animals. By measuring reproductive hormones we also diagnose pregnancy, monitor the health of ongoing pregnancies, and predict the approximate date of birth. We have determined that most pregnancy losses in this species occur at about the five-month mark in an up to 16-month gestation period, and have devised a hormone treatment to help okapi mothers maintain “at risk” pregnancies. San Diego Zoo Global contributes to conservation efforts in the okapi’s native forest habitat by supporting the Reserve de Faune a Okapis located in the Ituri Forest of the Democratic Republic of the Congo. Annual funding to the Okapi SSP goes directly to the reserve to support guards who keep okapi poachers at bay and exclude human encroachment into okapi habitat.